SINN FÉIN in Dublin West have selected local man Paul Donnelly as the party’s new representative on Fingal County Council to replace outgoing councillor Felix Gallagher. Donnelly was unanimously backed by local party members at a selection convention chaired by Dublin MEP and Sinn Féin Chairperson Mary Lou McDonald on Thursday, 10 January. The party’s ruling Ard Chomhairle also approved the selection at their monthly meeting held in Dublin on Saturday, 12 January. Paul Donnelly will now seek co-option to Fingal County Council at its monthly meeting on Monday, 11 February. 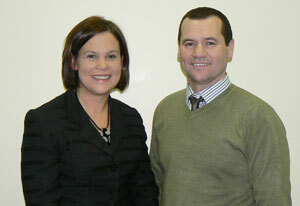 “I am honoured to have been selected to represent Sinn Féin on Fingal County Council.